Warehouse managers have a number of inventory management software solutions at their disposal to help them more effectively manage incoming and outgoing supplies. Of all the available data collection options, however, voice picking software may be one of the most powerful systems not utilized widely in the industry. Time savings - Writing for Multichannel Merchant, warehouse efficiency consultant Rene Jones noted that warehouse workers spend approximately 70 percent of their time walking to and from item storage locations and updating the inventory management system. When these employees utilize outdated warehouse management solutions, their efficiency is significantly diminished. However, with a voice picking system, employees spend less time dealing with hardware and more time accomplishing mission-critical tasks. Happier employees - Workers thrive when equipped with the best possible solutions, and their overall job satisfaction declines when they have to use outdated technology. Supply chain expert Aneesa Siddique wrote in a recent Business 2 Community article that employees are happiest when they are most productive, which is why voice picking improves job satisfaction ratings. Fewer injuries - In tall warehouse settings, workers risk injury when they have to climb ladders with equipment in hand to note inventory located in hard to reach places. With a voice picking headset on, employees have full function of their hands, which means they are more easily able to maintain their composure and balance at all times, according to Siddique. Improved communications - Sometimes employees may have difficulty verbally communicating with others. Siddique noted that voice picking integrates verbal data from multiple end users, thereby making it easier for workers to share this kind of information with each other and managers. 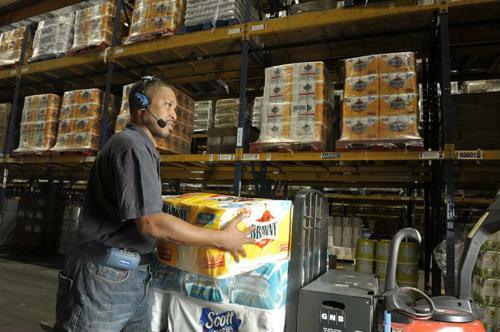 Better accuracy - Many warehouses rely on manual processes for inventory management. By eliminating these workflows with modern solutions like voice picking, Jones wrote that warehouse managers can have more accurate physical inventory counts. No business can expect to run an efficient supply chain if its warehouse counts are off, and voice picking helps companies to avoid this problem. "The value of implementing a voice picking system can be judged against real cost reductions from its advantages, such as elimination of printing costs and cutting down on training time and potential injuries or inventory losses," Siddique wrote. "Voice picking technology is not tomorrow's future, but today's reality. To be successful and competitive, smart business owners know when to take up a great new practice, and from its rapid adoption it's clear that voice picking is indeed the new paradigm in solid warehouse management." How much faster do you think voice picking is versus screen and keyboard? Watch the video "Bulk Picking Comparison: Vocollect Voice vs. Screen & Keyboard" now.